Let’s talk truth: The world is online. 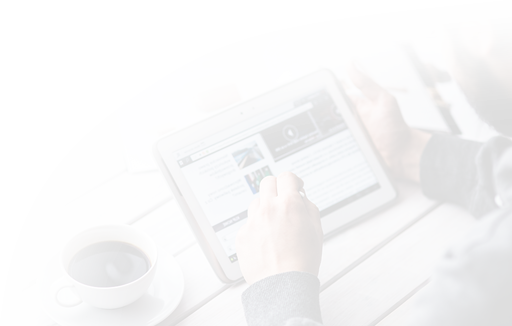 If a business or company doesn’t have a functional and appealing online presence, it’s unlikely you’re going to want to engage with them. And if you are a business, a working website is critical to the success of your company. It’s 2018! If your business doesn’t have a website by now, it should. As a writer, I knew I needed my own piece of internet real estate if I wanted to market myself, and ideally, to advance my career. I needed to be searchable and have a branded space populated with content to showcase my work. The problem? Well, I’m a writer, not a tech wiz. I had no clue where to begin. Maybe you’re just like me — a rookie interested in getting yourself out there (virtually), but unsure of where to begin, feeling intimidated by the technological steps of setting up a website. Let’s ride this wave together, shall we? 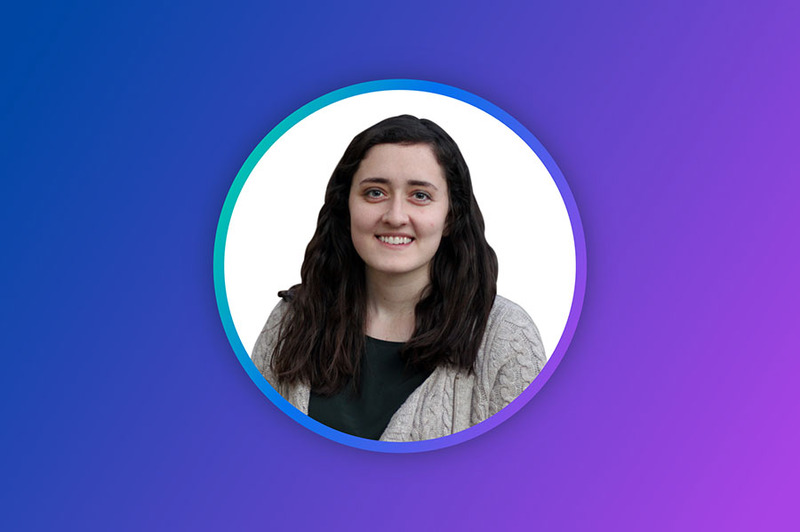 In this post, I’ll share my beginner-friendly, step-by-step process of getting a killer website set up easily with DreamHost, and how I got up and running in under an hour. I promise — you can do it, too. Let’s get started! Ready to carve out your online presence? Start by choosing the right hosting plan for your business! What Do You Need in a Web Host? With some basic research, I learned that I not only needed to create my website, but I also needed a web host to get my site on the internet. It’s less confusing than it sounds — simply put, a web host is a provider that gives you server space so your website can be found on the web. So, a web host is a pretty vital tool. As I was starting the process, I wasn’t about to pick any ol’ web host. I needed quality. I needed ease. And especially as a beginner, I needed support. Based on the needs of my site I developed a requirement list — i.e., what should my hosting provider offer me as a website owner? Here were my five must-haves. Websites are not one-size-fits-all. Some get heavy traffic and need customized e-commerce options; others cater to smaller crowds. I needed a hosting provider that offered a variety of options, tailored to my current needs, while providing flexibility for growth over time. I needed choices. If at all possible, I wanted to avoid the advanced-degree-required learning curve for setting up a beautiful website. I’m a beginner, not yet fully versed in the universal language of web development. Plus, like many of you, I’m crunched for time. I needed to be able to set up a great-looking site during my kids’ nap time. I didn’t want my hosting service to cost an arm and a leg — hey, I’ve got bills, too! I needed an easy-on-the-wallet hosting option that still offered me professional service and quality hosting. A web host, while still an investment, shouldn’t break the bank. Because I’m already familiar with the CMS of WordPress — having started a bunch of this-and-that blogs in the past — I wanted my web host to have WordPress compatibility (again, trying to avoid learning curves here). I wanted to be able to keep my comfortable WordPress surroundings and hit the ground running without any hiccups. Even with an easy-to-use web host, I knew there would be times where I would be banging on my keyboard when things went wrong. I needed a web host with all-access customer service for questions and comments. I needed a provider that would be supportive at every step of my web journey. 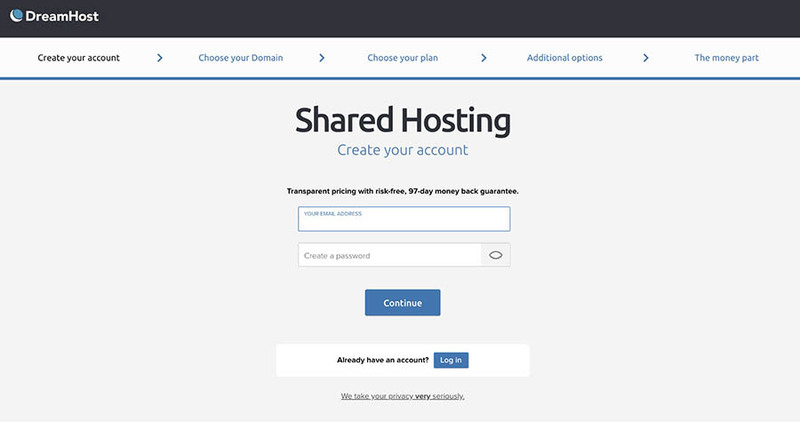 With my hosting shopping list in mind, it wasn’t hard to single out DreamHost as my top choice for web hosting. Why? 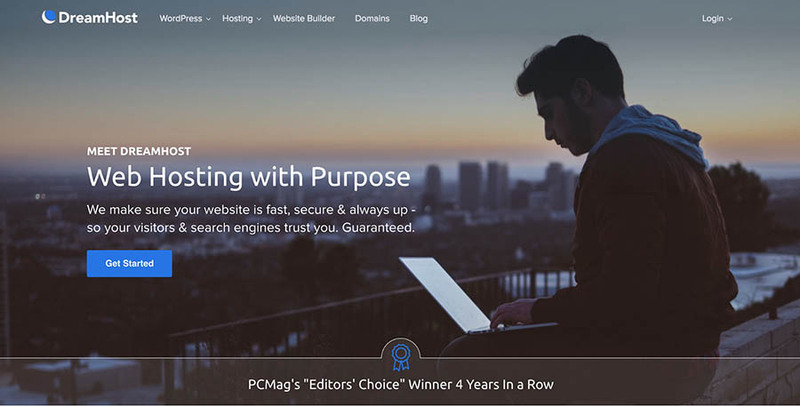 This award-winning web host is a one-stop-shop provider featuring an easy-to-use control panel, 24/7 support, extensive and flexible plan options, and lots more — all at an affordable cost. Plus, DreamHost is officially recommended by WordPress! Can’t beat that stamp of approval. 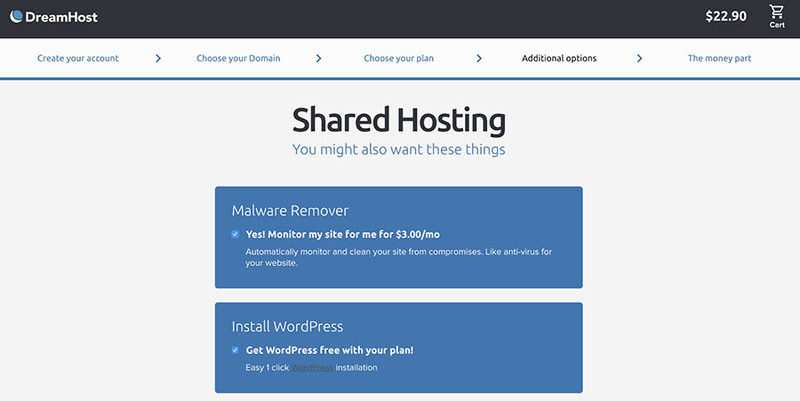 DreamHost’s Shared Hosting gives you everything you need to thrive online. Sign up today! So, what’s it actually like to set up a website with DreamHost? Whether you’re considering DreamHost as the hosting provider for your website or you’re currently using another service, know that DreamHost can be an A+ option for you, no matter the needs of your site. Let’s walk step-by-step through the process of setting up a website with DreamHost — visuals included! Because of my newbie status, I knew I wouldn’t be expecting Cyber Monday amounts of traffic on my site (at least, not right now. A girl can hope, right?) So a Shared WordPress Hosting Starter plan felt like the right place for me to start — and it could be for you too, if you’re an individual or small business just trying to get your name out there. 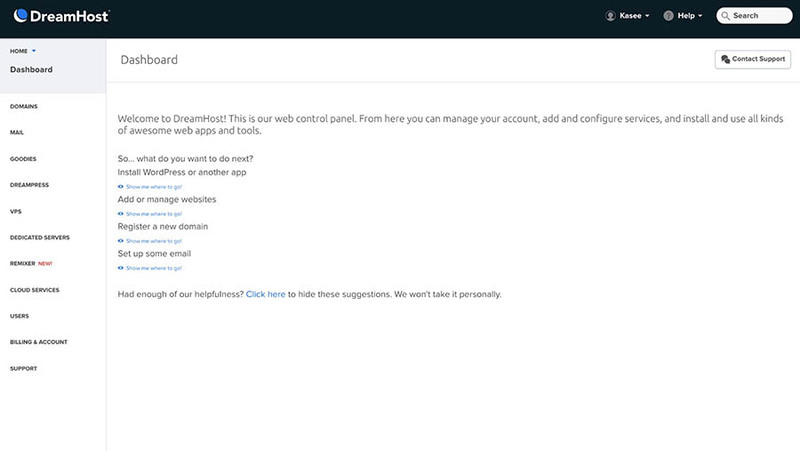 Next: creating a DreamHost account. Easy-peasy! (Don’t forget to choose a strong password! No 1234 here). 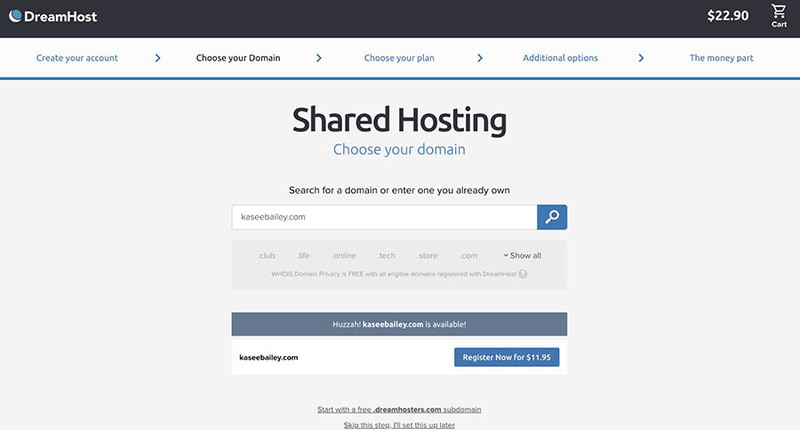 As if you needed yet another reason why DreamHost is the bomb.com, choosing a domain is easy. It’s also included free with one-year hosting plan packages. Score! Because I wanted to brand myself and my freelance writing business, I chose my name as my domain name; luckily, it wasn’t taken. If you’re a small business, your domain will likely be your business name. But if you need options or want to get creative, make sure to brush up on the SEO best practices for domains before you commit. Now onto the dollars and cents. As I mentioned, money was a factor for me in deciding which web host to use. 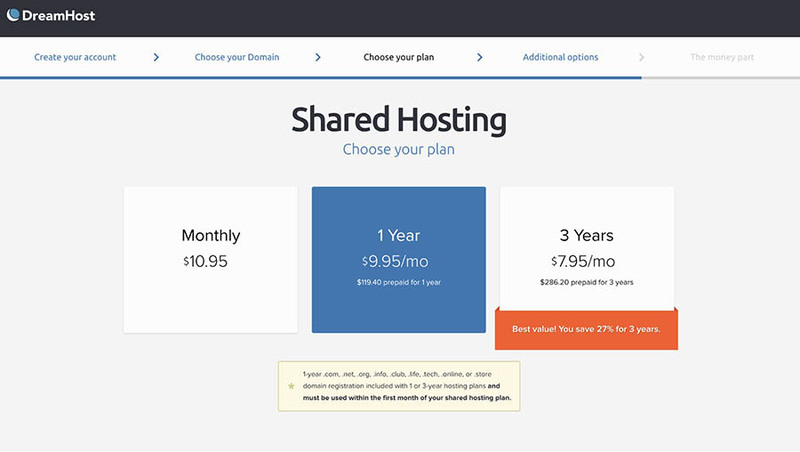 With shared hosting and other plans, you can choose month-to-month payment plans or annual options. To save a little extra $$$, I chose a yearly plan to get things started — a good middle ground. If you just want to give your plan a try, select the monthly option. If you’re more confident, go for three years — it’s easily the best value at $7.95 a month. Want to know how much you’ll ultimately pay? Keep an eye on the top right corner of your browser during set-up. 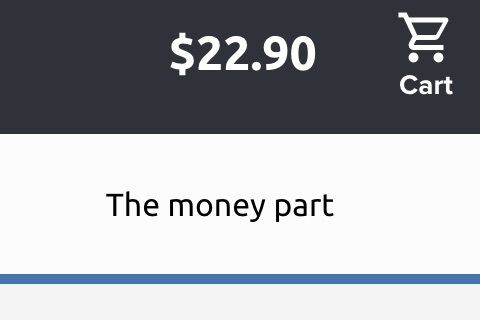 DreamHost is transparent about pricing — “the money part” will keep you clued in to what your total payment will be. Once you select any additional options you might want, you pay up, and voila! Your DreamHost plan is set up. Now you can access your DreamHost dashboard, where you’ll find account details and manage additional setups. Here, you can register your domain, set up mail (yes, you can get a designated email that matches your domain! ), and install apps. For me, the next step was to get WordPress installed. So where to do that? One-Click Installs on the left navigation panel will take you where you need to go. WordPress installation is lightning-fast. With the installation complete, I logged into WordPress and get started customizing my site theme and creating content. 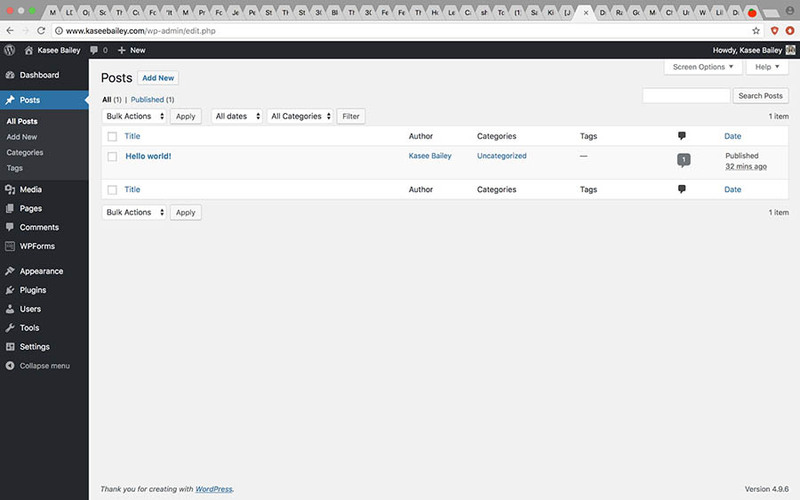 WordPress has tons of theme options — both free and paid — and scanning through options was (surprisingly) fun. I got to match my theme to the feel I wanted my website to have. You can even upload other compatible themes you’ve purchased or downloaded from other sites. I chose CoupLite from Themes Kingdom and uploaded it in the Themes panel. FYI: DreamHost has an extensive library of help articles on tons of WordPress-related topics! Now, it was time to start creating. From the Posts section, I started writing blog posts, outfitting them with images and selecting categories. I’m no photographer so I needed some images that I could integrate with my site cheaply. I found beautiful royalty-free images on the web and did some basic editing. Now I could start fine-tuning my design, implementing expert blogging tips, setting up plugins, and polishing my posts. Truly, DreamHost makes setting up a site quick and painless. (Let’s be honest: there’s enough in the tech world that’s confusing.) Anyone — seriously, all skill levels — can create a professional-looking site without sacrificing tons of time or money. If you’re still on the fence: what’s keeping you? You can do it in 60 minutes or less too.